Growing up in NJ, espresso shacks were uncommon, so when I first was acquainted with them, I became enamored with the concept. But over the years, I've come to understand that most espresso shacks have decent coffee at best, and more often then not they only provide a convenient caffeinated jolt for the rushed commuter. But on the few occasions where I run across a good one, the operation has a unique factor or two. My most recent brush with such a rarity was in Cortland, NY at a visually nonchalant venue called Coffee Mania. I had researched coffee in the area and found that while Coffee Mania was a drive thru, they actually roasted their own beans (they even use Cup of Excellence!). Driving up to the Port Watson location, the drive thru displays a retro 1960s look, complete with tan siding and a large winged roof. There wasn't much else to the property except that the parking lot has a spacious layout and made pulling up simple. As mentioned above, they roast their own beans (though they roast under another name called Coffee Depot). The coffee on tap (drip) was a Mexican Chiapas that sampled smooth, earthy and nutty, although also a bit stale; a good coffee but not all that distinct. Looking to to the espresso, while it was served in a paper cup, the shots tasted surprisingly good: decent crema, low acidity, and a nice lemony sweetness with but a smidgen of char on the tail end. I failed to note the tea. Driving away, I have to say that while the facilities could stand some visual stimulus, the coffee operation of Coffee Mania really left me impressed. It seems that the business itself is expanding and hopefully one day, they can fully realize their full potential. 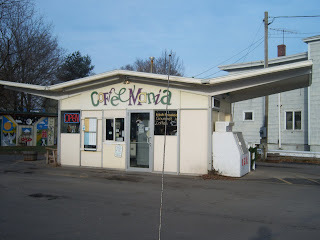 In the meantime, if you're in Cortland, give Coffee Mania a try. The "hut" at the Port Watson Coffee Mania was originally a Hess gas station, with just enough room inside for the attendant.